Katrina Milosevic is an Australian actress who has appeared in many television programs and theatre productions. Katrina Milosevic graduated from Australia's National Institute of Dramatic Art (NIDA) in 1997 with a degree in Performing Arts and went on to work on series including The Games and Blue Heelers. 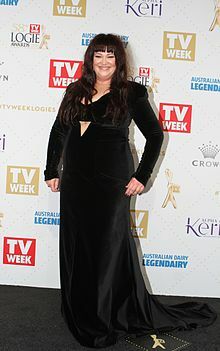 In 2003, she was cast in the regular role of Sophie Novak in Stingers, which saw her nominated for the Most Popular New Talent Female at the 2004 Logie awards. She remained with the show for two seasons. Milosevic acted in the 2005 Nine Network telemovie Little Oberon. September 2006 saw her join the Sydney Theatre Company's adaptation of the Neil LaBute play, Fat Pig. Milosevic joined the cast of Neighbours as Kelly Katsis, a love interest for Toadfish Rebecchi (Ryan Moloney) in 2008. Milosevic's father died during her first week on set and she said that working on the show was what she needed at that time. Milosevic left Neighbours in February 2009. In 2010, Milosevic joined the Sydney Theatre Company's adaptation of Gross und Klein (Big and Small). The play premiered at the Sydney Theatre in 2011, before it went on tour in Europe in early 2012. Milosevic has had a starring role in Wentworth as Sue "Boomer" Jenkins since 2013, and will appear in the fifth season of Winners & Losers. She also has a recurring role on Glitch. 2009 City Homicide Cassie Holmes Episode: "Dead Weight"
2009 Rush Karissa Episode: "Episode #2.21"
2010 Sleuth 101 Gil Episode: "Delete Cache"
2012 Laid Wheelchair Pam Episode: "Episode #2.1"
2013 Mr & Mrs Murder Eve Blake Episode: "A Dog's Life"
2013 Twentysomething Career Counsellor Episode: "Everyone Loves a Comeback"
2016 Offspring Anna Episode: "Fallout"
^ Phyland, Jan (16 April 2004). "Carpet baggers". The Age. Fairfax Media. Retrieved 13 November 2010. ^ "Katrina Milosevic". Perfectblend. Retrieved 13 November 2010. ^ Miller, Kylie (7 April 2005). "Movie roles for Brett Climo". The Age. Fairfax Media. Retrieved 13 November 2010. ^ Low, Lenny Ann (22 September 2006). "Live and let diet". The Sydney Morning Herald. Fairfax Media. Retrieved 13 November 2010. ^ a b "Farewell Katrina Milosevic". Neighbours.com. Network Ten. 19 December 2008. Retrieved 29 August 2010. ^ "Gross Und Klein (Big and Small)". Sydney Theatre Company. Archived from the original on 24 November 2010. Retrieved 13 November 2010. This page was last edited on 30 March 2019, at 00:36 (UTC).